I always find (and this applies to crafts, as well as food and drink) that small-batch or hand-crafted things taste/smell/look better, and Bessie’s Yorkshire Preserves are a cracking example of this. They use a traditional “open pan” method to make their homemade range of artisan jams, chutneys, fruit- and savoury- vinegars, and the care and attention that goes into their making shines through in every mouthful you take. At my recent foray around the Fine Food North (FFN) Show in Harrogate, I had the good fortune to have a chat with Elaine, one of the makers of these fine products. The team have recently been working with York Gin, and the York Gin and Grapefruit Marmalade I tried first off was superb; the perfect balance of sweet and piquant for any breakfast morsel. I also noticed some of Bessie’s Yorkshire Preserves fruit vinegars on their beautifully set out stand and dipped into a couple – purely for research purposes! The Lemon vinegar was wonderfully zingy, and I was surprised by how good the Strawberry version was too. The delicious Aubergine Pickle had just been revealed as one of the (12) Editor’s Choice awards at this produce show, so that was top of my “to try” list! The small bit I had on some bread was superb, and Elaine very kindly gave me a full-size jar to take home, as well as some of the Fig and Balsamic Chutney, and the sunshine-hued Piccalilli. His Nibs has become rather partial a bit of Piccalilli, so that was the first jar we cracked open. We both liked the fact that Bessie’s Yorkshire Preserves have given their version a nicely manageable chunkiness; some Piccalilli’s can be a bit too large chunk-wise to be easy to handle on a spoon, and others are just too small as to yield that satisfying crunch factor when bitten into. There was also a lovely range of vegetables within the product too, which made for a very pleasing visual effect in the jar, on the bread, and against the Ham we’d chosen to pair it with. The sunny toned mustard base was perfectly pitched heat-wise so that you got a good hit of spice on the tongue, but it didn’t overwhelm the crunchy veggies. Next up was the Aubergine Pickle; this was spicier heat-wise than the Piccalilli, and it also had a gorgeous, light smoky edge to it. The Aubergine has been sensitively handled in this pickle to ensure that it hasn’t disintegrated into a soft, homogenous mush. Having tried it properly, it’s easy to see why this (deservedly) got one of the Editor’s Choice spots at the FFN show. I love Figs, whether they’re fresh, dried, or preserved, so I was particularly looking forward to trying out Bessie’s Fig and Balsamic Chutney. This is a fab chutney because as well as instantly getting the fragrant, sweet Fig notes on the palate, it then goes on to reveal the sharper Balsamic element which prevents it from being too sugary. Texture-wise, this chutney is lovely and soft, making it an absolute doddle to spread onto even the crumbliest of crackers without them disintegrating into a million pieces. I popped a little smidge of Goats’ Cheese onto my cracker too, and the combo was just divine. All in all, a very successful evening of munching I would say! Hot Wings given for these marvellous morsels! 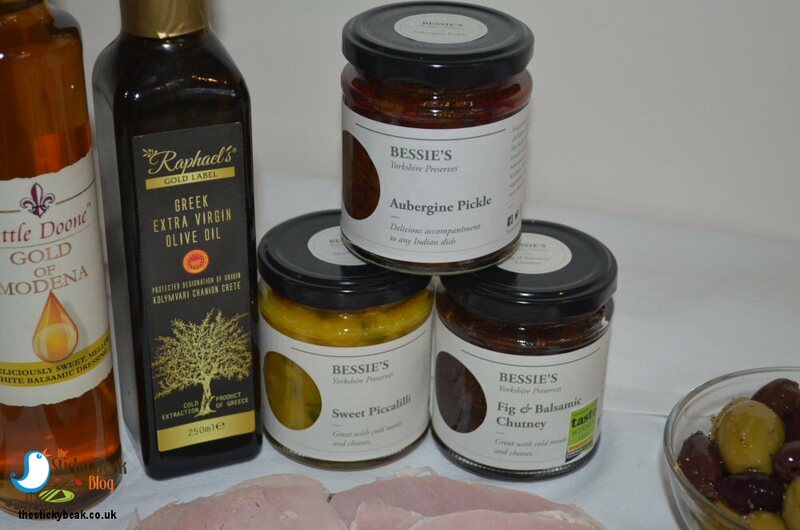 For more information, head over to www.bessiesyorkshirepreserves.com Thank you to Elaine for giving me the chance to try these delights.